We help find lost stuff for FREE !!! Lost Wedding Ring Found - Winston Salem, North Carolina!!! What is the purpose of the Lost My Stuff Group? Why should I join this Group, if my metal detecting club already provides this service to people? Are there any requirements to be a member of the Group? How do I report a lost item to the Group? What happens when someone sends a Lost Item Report to the Group? Does the Lost My Stuff Group search for and find all the lost items that get reported? Should I post an ad about my lost item on Craigslist? Can I have Lost Item Reports sent to me as text messages to my cell phone, so I can receive them while I'm out detecting or otherwise away from a computer? How can I get a copy of a Lost Item Report? Why do some of the pointers on the Members Map have names/labels on them in addition to their ZIP/Postal Codes? How can I have a similiar one added to my map pointer? What are the expenses of the Group and how are they paid for? How can I make a donation to help support the Group? How can I get a Lost My Stuff Window Sticker? How do I submit a Success Story for publication on the Group Website? Who can I contact to ask questions or make comments about the Group or its activities? Where can I download copies of the Group's Flyer for posting in my area? The purpose of the Lost My Stuff Group is to provide FREE search assistance from people with metal detectors to people who have lost rings, bracelets, or other jewelry or metal objects outdoors and would like help to try and find them. We don't charge a fee for our services, nor do we expect a reward when we're successful. Our only goal is to help people in need, because we all believe it's just the right thing to do. For only one reason -- so you'll be able to help more people!!! All Metal Detecting Clubs have members who are more than happy to help people search for lost stuff if asked. But knowing who to contact when you lose something, especially when you're on vacation or away from home is difficult at best. The Lost My Stuff Group wants to change that. We want to become "The Place" to contact -- "The place" people know they can always contact to find some free help to find something, no matter where in the world they happen to be at the time. Joining the Lost My Stuff Group won't affect your relationship with your club at all, it will just make you much more available to people looking for help. You must have a metal detector and know how to use it. You must agree that whenever you help people you became aware of via Lost My Stuff that you will never request or solicit for any sort of fee or reward for your efforts. You must not be a member of a group that asks for or charges any sort of trip fee or monetary reward for any assistance you provide. We require each of our volunteers to pay a $2 yearly Group Membership Fee. These fees are used to help us pay the Group's operating expenses (website hosting services, software purchases & updates, code changes and troubleshooting, domain registration, internet access, backup services, etc.). If you would like to join the Group, just sign up on our Volunteer Page. Upon doing so you'll promptly receive an email from us confirming you're all signed up. To report a lost item to the Group just send us a Lost Item Report by completing the form on our Report a Lost Item Page. What happens when someone reports a lost item to the Group? The first thing that happens is the report gets read to make sure it isn't spam or something. After that quick check, the report is then reviewed to determine if any additional information is needed to better identify what type of search will be required to try and find the item. If additional information is required, the person who reported the lost item will be contacted and once the additional information is collected, if it's possible for the Group to help, the Lost Item Report will be posted on our website and sent out to our Group members. If upon receiving a Lost Item Report any of our Group members determine they are in a position/location to help, they will contact the person who reported the lost item and see what can be done. 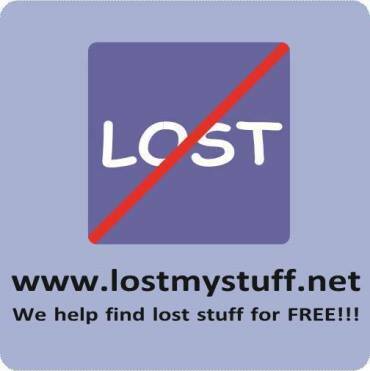 As we state on our website, the Lost My Stuff Group is a FREE service. We don't charge a fee for our efforts, nor do we expect a reward when we're successful. If anyone who contacts you to help search for your lost item indicates they are a Lost My Stuff Group member and requests any sort of fee or reward for their efforts, or offers to rent or sell you any equipment you can use to search for your lost item yourself, or requests you to sign any sort of contract or agreement, please notify the Lost My Stuff Group ASAP by sending an email to Owner@lostmystuff.net with as much information as possible (the person's name, email address, phone #, what was said, etc.). We will look into the situation immediately -- This should NEVER happen. Unfortuantely no... The Lost My Stuff Group currently has enough Volunteers available and in the right locations to search for about 50-60% of the lost items that get reported. As we get more and more members, we of course are able to search for more and more lost items. Of the lost items our Volunteers do search for, over half of them are generally found. If you've lost an item, posting a notice on Craigslist identifying what you lost and asking anyone who happens to find it to contact you may be a good idea -- At least it can't hurt to try. But, if you do post such an ad, make sure you don't identify the location where it was lost so specifically that someone could read your posting, go to the location, find your lost item and take it to the nearest pawn shop!!! (Say in your ad that you lost the item in the park, but don't say you lost it in the park between picnic table # 4 and the swings). Unfortunately, people have been known to search Craigslist ads just to find out about lost items they can go find for personal profit. Please also note -- If you do post an ad and someone responds indicating they've found your item, use the appropriate cautions as listed on our Safety Page whenever you meet anyone you don't know. Yes, you can receive Lost Item Reports as text messages on your cell phone, and it's actually quite easy to set up. This isn't a special iPhone ap or anything like that. Every cell phone has an email address, so... if you want Lost Item Report emails sent to your cell phone in addition to your regular email address, just send us your cell phone email address and we'll set it up. If you don't know what it is already, your cell phone's email address is just your 10 digit cell phone number (area code + 7 digit number), followed by the @ sign, followed by the cell phone service carrier gateway address. As an example, a typical cell phone email address for an AT&T cell phone would be 1234567890@txt.att.net or 1234567890@mms.att.net. (Both of these addresses work just fine, but members have indicated they get better results by emailing to the multimedia (mms.att.net) address. When using the standard (txt.att.net) address the email length is truncated after so many characters, and it also gets partitioned with a bunch of 1 of 9, 2 of 9, 3 of 9, 4 of 9, etc. break points). Before you send us your cell phone email address to add to the list, please make sure you test it first!!! Send your cell phone an email (to what you believe is your correct cell phone email address) to make sure it's correct and so you know how it will display on your phone. Also take into consideration that these messages will cost you the same as text/mms messages on your cell phone bill. To get a copy of a Lost Item Report simply click on the "Request a Copy of a Lost Item Report" menu button. After providing your Group email address and indicating which Lost Item Report you would like a copy of, the Lost Item Report will be automatically emailed to you. This website feature is available 24/7!!! Many members wanted to "personalize" their map pointers to better identify themselves on the map, so if a member asks, we label their map pointer with a short label of their choosing. (Many members use their usernames from Metal Detecting forums they are on). If you would like a label on your map pointer just send us an email indicating what label you would like added. (Send the email to owner@lostmystuff.net). The only expenses of the Group are the expenses incurred by our members when they help people search for lost items and the expenses to maintain the website. All members donate their metal detecting skills, time spent, and travel expenses helping people search for their lost items and are required to pay a $2 yearly membership fee in order to receive the contact information for all the Lost Item Reports, which is used to fund all the expenses of maintaining the website. Donations are of course accepted from all who are generous enough to contribute! To pay for your sticker(s) just click on the "Donate" button beneath the Navigation Menu on any of our website pages and this will let you make your payment via PayPal. If you prefer not to use PayPal simply mail your payment to: John Hawken, 11535 Royal Ivory Crossing, Houston, TX 77082. Whichever method you use, you will also need to make sure to email us your mailing address so we'll know where to send your sticker(s)!!! (Send the email to owner@lostmystuff.net). Just send all the information (including any related pics!) to the Group moderator at Owner@lostmystuff.net. Any questions or comments concerning the Group or this website can be sent to the Group moderator at Owner@lostmystuff.net. At the bottom of this page!!! Below is a Flyer (in pdf format) that we created for posting in public places to let people know about the Group. It is full-sized -- one flyer fits on a standard size 8-1/2" x 11" sheet of paper, as shown below. The below Craigslist Post (in pdf format) is an example of an ad we've successfully posted on Craigslist to let people know the Group is available to help them search for their lost stuff. If there's not one already posted on your local Craigslist, please consider putting one up!